ACES-Energy Mechanical Division is here to service your existing systems. Our mechanical division project manager and team leader has over 25+ years of experience in the field. We service both residential and light commercial applications, with specialties in complex hydronic systems. 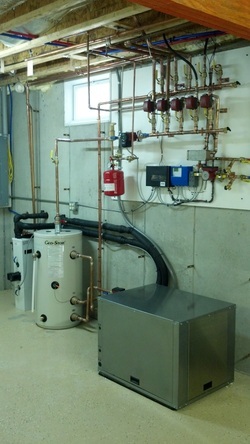 We also have a wealth of knowledge in tankless and on demand water heaters. Our service vehicle is fully stocked with a complete inventory of Navien tankless and combination water heater parts. You can count on us to repair your Navien water heater in a single service call in the Rochester & Finger Lakes region. We boost a factory trained and certified Navien technician to both install, repair and complete warranty work on your tankless water heater. In addition, we welcome your complex hydronic heating systems that others walk away from. often, we are called to repair a re-occurring problem that another contractor can not fix. Usually, after an cursory overview of the system, we make a slight design change and implement the fix that eliminates any future service calls, keeping you comfortable while saving you money! Our service team is also certified in traditional refrigeration and HVAC systems with knowledge to complete the toughest jobs. We also custom tailor maintenance packages to large estates, multiple-properties and commercial facilities.